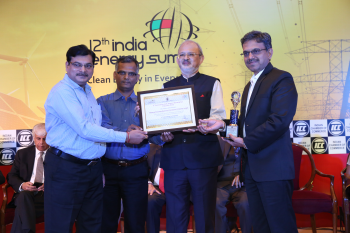 MSEDCL has been awarded with ‘Special Recognition Award’ for Managing Large Customer Base in the category of Efficient Distribution & Operations for excellent management of large Consumer base at 12th India Energy Summit, Organized by Indian Chamber of Commerce and Supported by Ministry of Power, Government of India. 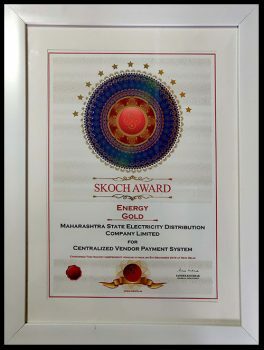 MSEDCL has been awarded with SKOCH Energy Gold Award for Centralized Vendor Payment System at SKOCH Summit 2018, an exclusive ceremony held at New Delhi on 6th December 2018. MSEDCL introduced a true ease of doing business initiative of Centralized Vendor payment system using fast, robust & secured digital payment process. Centralized payment is implemented to avoid the delay in the payments to suppliers, contractors, statutory payments and employees. As on Nov-18, the Centralized Vendor Payment System has benefitted around 81,000 Vendors who have received their dues (worth Rs. 1300 Crs) instantaneously using online payment API since go-live this system. 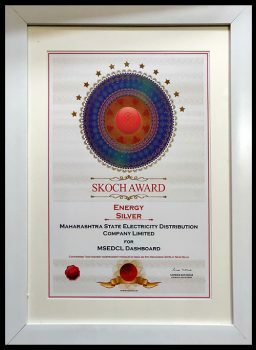 MSEDCL has been awarded with SKOCH Energy Silver Award for MSEDCL Dashboards at SKOCH Summit 2018, New Delhi. The MSEDCL Dashboards is a unique system developed at MSEDCL providing at-a-glance views of KPIs (key performance indicators) relevant to a business process (e.g. Energy sales, payment collection, material stock, or balance sheet). MSEDCL Dashboard ensured quick data analysis and helps to take appropriate decision at right time. MSEDCL has also been awarded with SKOCH Order-of-Merit 2018 Awards for MSEDCL Consumer Service Initiatives, such as Centralized Customer Care Centers for all its. Consumers, sending various Meter Reading & Billing alerts through SMS to over 2 Crores registered Consumers and resolution of consumers’ complaints through social media like Twitter & Facebook. MSEDCL has also been awarded with SKOCH Order-of-Merit 2018 Awards for implementing Substation Monitoring System at Akola Town. This systems enables live Data availability for various substations equipment such as circuit breaker, transformer, feeder and DC battery system which facilitates carrying out various analytics helping in taking right decisions with respect to operational, strategic and planning of the Electricity Distribution system. SKOCH Order of Merit Award -2017 for Mobile Apps & Dashboard. Indian Smart Grid Forum (ISGF) Innovation award for Best Utility for R-APDRP Part ‘A’ implementation in India. Champion of Change Award- 2017 by Ministry of Skill Development and Entrepreneurship, Govt of India. Most Innovative Discom for the year 2017 at 5th Innovation with Impact Awards for Discoms by Indian Chamber of Commerce. MSEDCL has developed Mahavitaran Mobile application for Consumers that offers various facilities to consumers including application for new connection, bill payment, change of name and complaint registration. MSEDCL has also developed Mobile Apps for its Employees which enable its employees to take meter reading, carry out day to day field activities such as outage management, disconnections and recovery drive, load management, feeder reading, PD verification complaint resolution etc. MSEDCL has introduced analytics Dashboard which provide quick data analysis to higher authorities and helps them to take appropriate decision which has features such as New Service connection, Paid pending, Billing, Payments – offline / Online, Arrears Recovery/Position, Load Profile, CRM – complaint monitoring, Project Monitoring, Energy Audit. Last 3 years data can be analyzed and compared. MSEDCL has implemented SAP ERP solution and integration with various systems for Finance, Operations and Projects functions in its daily working. 2nd Award under Category of Green Grid Award at 5th Innovation with Impact Awards for Discoms by Indian Chamber of Commerce. MSEDCL has taken consumer awareness initiatives on Energy efficiency through rallies, seminar at school and public places, Distribution of pamphlets, putting the banners & hoardings, taking workshops and by making media awareness through its news letter, Distribution of LED bulbs as appreciation prize to meritorious students in the schools. MSEDCL has launched DELP (Domestic Efficient Lighting Program) in which it has distributed LED Bulb. MSEDCL has spent Rs 7.06 Crs on Demand Side Management activities. 1) Out of 1.75 crs Domestic Consumers, 40lakhs Domestic Consumers availed LEDs in DELP scheme. 2) Out of 40.16Lakhs Ag consumers 2209 Ag consumers have been benefited by star rated pump. 3) 1740 No of Ag consumers benefited by solar pump. MSEDCL has taken great efforts in fulfilling Renewable purchase obligation which is highest in country. MSEDCL has adopted solar Roof top policy /regulation notified by state regulatory commission, MERC time to time. CBIP Award for Excellence in Capacity Building & Training. Express Intelligent PSU Awards 2016 for MSEDCL Mobile Apps. Best Power Utility Award at 10th Indian Energy Summit 2016. Best State Power Utility Award and Green Grid Award at National Energy Council organized by Ministry of Power (GoI) and Indian Chamber of Commerce at New Delhi. Honoured with The National Energy Conservation Award 2014 organized by the Central Power Ministry for its contribution in the field of energy conservation. Bestowed with the Best Employer of the year and Best Organisation and Staff Development by the World HRD Congress 2014. Conferred with the Asia Pacific HRM Award 2014. Maharashtra State e-Governance Award 2013 for Restructured Accelerated Power Development and Reforms Programme (R-APDRP) Part ‘A’. Won the 6th Indian Power Award 2013 by the Council of Power Utility, Delhi for the various works done by the Company. Won the second place Power Excellence Award – 2013 by the Kolkata Chamber of Commerce.